Representing over 30 golf courses in the Las Vegas area, Golf Adventures provides an unbeatable rate on combined hotel and golf packages. Representing over 8 golf courses in the Niagara Falls area, Golf Adventures provides an unbeatable rate on combined hotel and golf packages. Representing over 7 golf courses in the Cabo San Lucas area, Golf Adventures provides an unbeatable rate on combined hotel and golf packages. Representing over 30 golf courses in the Scottsdale area, Golf Adventures provides an unbeatable rate on combined hotel and golf packages. 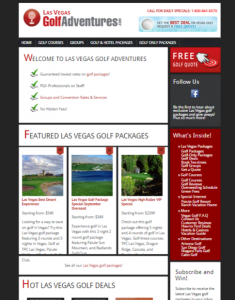 Representing over 30 golf courses in the Las Vegas area, Golf Adventures provides an unbeatable rate on combined hotel and golf packages through our popular website LasVegasGolfAdventures.com. Through Las Vegas Golf Adventures, golfers are given a choice of multiple on-strip hotels such as ARIA, the Bellagio, the Mirage and other popular accommodations in Las Vegas. Golfers may also book golf-only packages which do not include accommodations.